BEIJING — Chinese people have found the tax expenses on their October pay slips drop drastically after new tax brackets were adopted on Oct 1, according to the State Administration of Taxation (SAT). The tax reduction amounts to 31.6 billion yuan in total while more than 60 million people have been completely exempt from individual income tax, SAT statistics showed. Taxpayers in the manufacturing industry benefited the most after the minimum threshold for personal income tax was raised from 3,500 yuan (about $510) to 5,000 yuan per month starting October. Their aggregate tax payment dropped by 5.85 billion yuan, accounting for 19.3 percent of the total reduction for October payrolls. 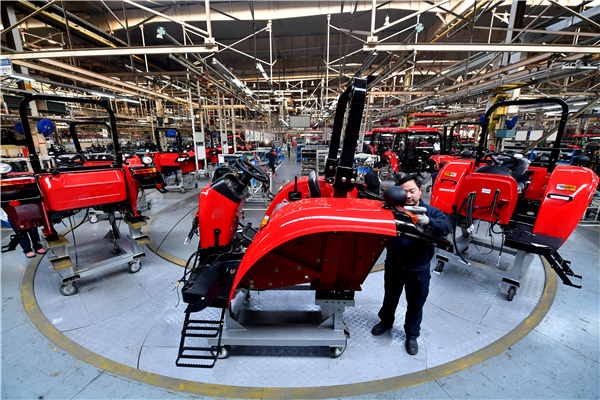 Employees in the equipment manufacturing sector posted an aggregate tax cut of 3.43 billion yuan — 58.7 percent of the total reduction for manufacturing employees. Private enterprises also saw noticeable tax cuts, with their employees paying 16.45 billion yuan less. Analysts say these changes conform to the objectives of the tax reform which are to facilitate social justice and increase the growing vitality of the Chinese economy. Luo Tianshu, director of the Income Tax Bureau of the SAT, said taxpayers who earned less than 20,000 yuan in October found their tax expenses more than halved. Their aggregate tax expenses were 22.4 billion yuan less. Wage-earners have seen their tax payment slashed by 41.3 percent or 30.41 billion yuan in total. Li Wanfu, director of Taxation Science Research Institute, said the income tax cuts were substantial for private businesses, which would give a boost to them and enhance their competitiveness.